What is GreenSky Wind Systems? 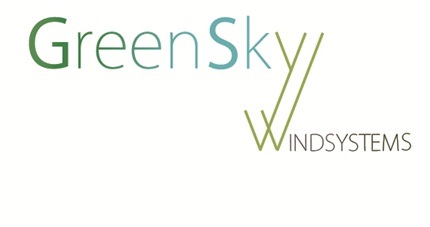 GreenSky Wind Systems, LLC is a Raleigh based start-up created by William Hyerle and Quentin Ankri. It will be introducing a new small wind turbine to the American market. The product we are introducing to the market is the Toroidal Wind Turbine (TWT10), a 10kW roof-mounted turbine targeted to companies and their commercial facilities. Our Australian partner, an R&D firm, J.Bertony Pty Ltd, developed it over a ten-year period. This turbine is an expansion of vertical axis designs. What pushed you to start this venture? We are passionate about renewable energy. Our planet will not be able to sustain our current way of life if we do not implement change. We wanted to promote a wind turbine system that met the needs for urban renewables, so far unanswered by current wind technologies. A great opportunity to do so came to us in October of 2010 and we decided to take it. There is an unmet need for rooftop mounted wind turbine systems. The products available transmit too much vibration to the roof structure and cannot operate in typical urban turbulent winds. How is this turbine different from existing turbines and is there a place for it on the market? There has been a growing interest for roof-mounted turbines but existing products do not exceed 2kW. Such turbines have also been facing difficulties in operating in turbulent wind speeds, which are found on rooftops. The TWT10 was designed specifically for operation in turbulent winds and will be the largest roof-mounted turbine available on the market. Thanks to a low RPM system, high torque, and its WingBlade technology, our product will outperform the competition on the only criteria that matters: $ / kW. GreenSky Wind Systems will receive a TWT10 kit to be installed in North Carolina for US testing & certification purposes. Once these tests are done, GreenSky Wind Systems will set up a manufacturing line in the United States. A retailer network will be established to sell the products. When revenue has been generated and our business model and product have proven themselves, GreenSky Wind Systems will scale up its product line with the TWT30 and the TWT100. What are your needs to reach your milestones? GreenSky Wind Systems is looking for partners that are committed to renewable energies and that are trying to make a difference. What’s been your experience so far in the entrepreneurial community? We created the company in October 2010. From that point we started to write the business plan, negotiated the license agreement with our Australian partners, created relationships with manufacturers in the RTP area, and tried to move on. From a young entrepreneur point of view, the RTP area has been a great place to launch a business. Thanks to the resources available in the region such as CED and the SBTDC, the community has helped us move forward and reach our milestones. We feel that renewable energies are of great interest here. This region has nothing to envy to the Silicon Valley, and we hope that RTP will keep on growing. What’s your favorite part of working in the start-up environment? Working in the start-up environment is very exciting. You will have stressful days where nothing goes the way you expect it to. But you will also have good days where things will actually go as planned. It is definitely the most stressful and busiest job we could have imagined. Especially when your own money is involved. To help us develop the company we realized a survey. Please complete it; your answers are critical to us.